Why do we treat the employees with the most knowledge about the customer with the lowest respect and pay them just above average salaries? Do not sales people who daily interact with customers have the deepest insight into customer needs? Do not field service employees who are at the customer site every day know the customer requirements best? Does not the customer service should know best what customers are complaining about and use this knowledge to improve the products and services the company is providing? There are basically two ways we can answer these questions. One is from the top down and one is from the bottom up. Both approaches tell us a lot about how we see and treat humans in business. In a classical organization there is an organizational distance between where the decisions are made and where the knowledge about the customer is. In a top-down organized firm the decision-making is at the top and the knowledge is at the bottom. This top-down approach is the dominating management style. Managers or supervisors tell employees what they have to do and how they have to do it. They do not get much feedback from those in lower hierarchical positions. The flow of information is form the top down. The decisions are made by a few and are executed by the many. The top-down approach provides a sense of control over the business to owners or upper management. This undifferentiated, autocratic “one-way” approach is only working in non-competitive environments. The top-down style, which can easily viewed as bossy or dictatorial, is appropriate when the leader is knowledgeable about the a problem and the solution to it is linear. That means there are a set of clear rules and only a single solution. Then efficiency can be increased with a top-down approach. For example to build a car in a manufacturing plant a detailed step-by-step plan is provided by senior, experienced managers to the assembly-line workers. What image do leaders have of their employees? The people at the top see themselves as superior to the employees and workers in the lower hierarchical levels. Although everyone is free in how to respond to externalities, who can blame managers if the whole system is forcing hierarchical thinking? Nevertheless, ideas on how to solve solutions are created by a few, which contributes to the superior thinking and isolation. The people on lower hierarchical levels are seen as chess figures, which simply perform the work provided in a given way. Most often this viewpoint goes hand in hand with the assumption that employees are lazy and need to be motivated to work. The result is that lower hierarchical levels or departments are often outsourced to low wages countries, like for example customer service or manufacturing. We, especially in Europe and the western part of the world, live in a knowledge-based society, where the problems are complex and the solutions are not that straight-forward anymore. The rules are diffuse and there is not one single solution to the complex problems most of us are facing in their jobs. New competition and disruption appears every day. Change is unavoidable. Is it still possible for a few persons to oversee a whole organization and to know what the best way to solve problems in all areas of the organization is? There are two kinds of knowledge: explicit knowledge and tacit knowledge. Explicit knowledge can be transmitted between individuals. It often appears in written manuals, data or scientific formulae. Tacit knowledge, however, is difficult to formalize, thus making it hard to share or even communicate. It refers to personal, subjective insights or intuitions. Knowledge is essential in our dynamic and fast changing world. So how is new knowledge created? Knowledge is created by making the know-how of the individual systematically available to a larger group. In their article Nonaka and Konno describe knowledge creation as “a spiraling process of interactions between explicit and tacit knowledge. The interactions between these kinds of knowledge lead to the creation of new knowledge.” They have identified four stages. In the first, the socialization stage, tacit knowledge is shared between individuals. Through spending time together and exchanging information personal insights are shared. This leads to forming a larger self, where an individual accepts the tacit knowledge of another person. The second stage is called externalization. In this stage the tacit knowledge is expressed in comprehensible forms that can be shared with others and understood by them. The ideas and intentions of the individuals fuse, thus building a group of shared thoughts. Combination marks the third stage of the SECI model. Explicit knowledge is systemized so that it becomes usable for other groups. In the last stage, internalization, the individual identifies relevant knowledge for one’s self. Through defined concepts, strategies or methods the explicit knowledge of the organization is internalized by the individual. By combining the explicit knowledge of the environment, group or organization, with the tacit knowledge of the individual the foundation is given for new knowledge creation. Thus the spiral continues with socialization again. In an attempt to see organizational learning as a strategic approach, Crossan and Berdrow have described the process of organizational learning in a 4I framework. It consists of four stages: intuiting, interpreting, integrating, and institutionalizing. The stages are similar to the SECI model. Organizational learning is building on the intuition of the individual. These experiences are interpreted and integrated on a group level, so that in the end new knowledge is institutionalized in the organization. Where is new knowledge created? In their case study with the Canada Post Corporation (CPC) Crossan and Berdrow make a distinction between two kinds of intuition. First, there is expert intuition, which is the ability to recognize past patterns. In interviews with employees of CPC this ability was attributed to the CEO. Entrepreneurial intuition is the second kind. It is the ability to realize parallel events and make new connections to foresee future possibilities. This intuitive and innovative insight, contrary to expectations, was not attributed to the CEO. In other words, the ability to come up with innovative solutions is not associated with the CEO of a company. Even though the CEO in the former top-down organized CPC had the decision making power, he lacked the most up-to date knowledge to anticipate new trends. Without knowing what is going on it made his decision making power obsolete. In a top-down organization the information flows only in one direction. 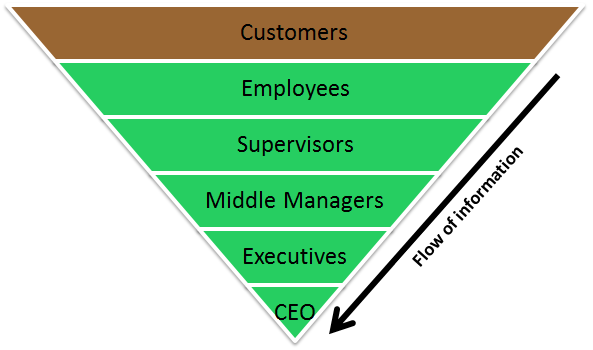 Therefore, the CEO does not receive feedback from lower hierarchy levels. The knowledge available is simply ignored and thus cannot be institutionalized and implemented in processes and routines in the organization. Does that not equip the employees on the lowest hierarchical level with the most power? Bottom-up is defined as “progressing from small or subordinate units to larger or more important units, as in an organization or process.” Isn’t it ironic that the definition already points out that the subordinate units are less important when actually the opposite is true? 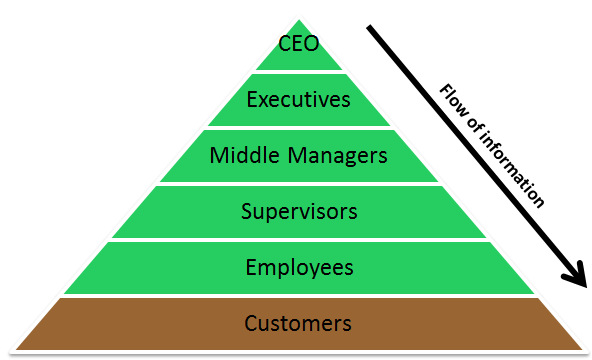 As it can be seen in the bottom-up chart, now the customers as well as the employees who interact with them on a daily basis are on the top. That not only emphasizes the customer focus, but also that the knowledge about the customer is valued. The huge potential which lies in the “collective expertise and creativity of the entire organization” is tapped into, since a bottom-up approach creates the foundation for knowledge sharing and collaboration. It also creates employee involvement, since the individual with the knowledge is involved in identifying and delivering optimizations. This again increases job satisfaction and motivation through higher commitment and identification with being part of the solution. Decisions are now made by those who possess the knowledge. How are employees seen in a bottom-up organization? Do we need managers and executives at all? With all the benefits the bottom-up approach brings and the way employees are treated, the question arises are managers and executives redundant? Although for many employees the work and purpose of middle managers seem not apparent, there is a (theoretical) importance in the position. By definition, a manager is the one who controls resource allocation. They are the ones who provide the employees with the support and material so that the individuals can do their best job. Stewart et al.have shown that combining bottom-up and top-down processes deliver the best out of both approaches. Their research states that a solely top-down focus failed to create enough commitment from employees. However, a pure bottom-up approach was not able to generate the necessary resources for the implementation of an initiative. Combining both approaches allows an organization to thrive. Management provides a framework that defines what actions and behaviors are in scope of the organization’s purpose. The direction for the development of the organization is set by management. How milestones to reach the defined vision are accomplished lies now in the responsibility of the individual, autonomous employee. The one who knows what is best for the organization. What approach does your company have? Crossan, M. M. and Berdrow, I. (2003) Organizational learning and strategic renewal. Strategic Management Journal, Issue 24, p. 1087-1105. John Wiley & Sons, Ltd.
Nonak, I. and Konno, N. (1998) The Concept of “Ba”: Building a foundation for knowledge creation. California Management Review, Vol, 40. No 3. Stewart, G. L., Manges, K. A. and Ward, M. M. (2015) Empowering sustained patient safety: The benefits of combining top-down and bottom-up approaches. Journal of Nursing Care Quality, Volume 30, Issue 3, p 240-246.